Use Tripp Lite's P036-002-20RA in server applications that require a higher rated, heavier gauge cable, as well as situations where right angle cable exit is required. C19 to C20 connectors, 3 x 12ga (3.31mm²) conductors, 20AMP rated, 250V - ideal for use with Blade Server Chassis. 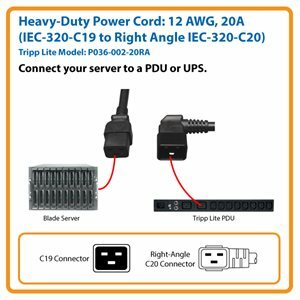 Use Tripp Lite’s Heavy-Duty Power Cord to supply power to network devices that require a heavy-gauge power cord, such as servers, routers, network switches and blade server enclosures. Featuring a right-angle C20 connector on one end and a straight C19 connector on the other, this cable fits in tight spaces to provide a reliable power connection from a PDU or UPS to your equipment. Connect the C19 receptacle to your network device and plug the right-angle C20 connector into a PDU or UPS outlet. The right-angled C20 connector makes installations easy in hard-to-reach spaces in back of equipment like servers, peripherals and rack enclosure cabinets. When plugged in, the P036-002-20RA provides clearance for closing cabinet doors while also saving space for improved organization inside crowded areas. The P036-002-20RA is manufactured using superior materials for reliable performance. The high-quality connectors are molded for durability and have integral strain-relief for a secure connection. This SJTW cable has three 12 AWG conductors and a 20-amp rating. For peace of mind, the P036-002-20RA comes backed by a lifetime warranty. It’s manufactured in compliance with strict RoHS specifications, reflecting Tripp Lite’s commitment to environmental responsibility.